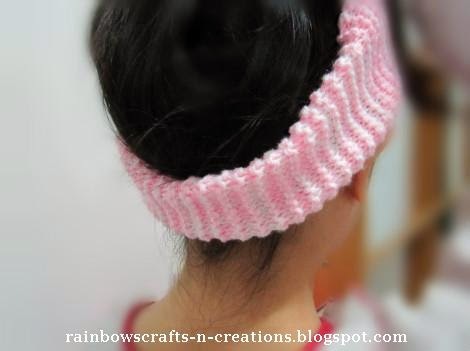 I knitted this headband with a basic knitting stitch -Garter stitch (knit every row). This time I get my knitting piece done by holding yarn double. It might sound very hard to do so, it's actually not that difficult. 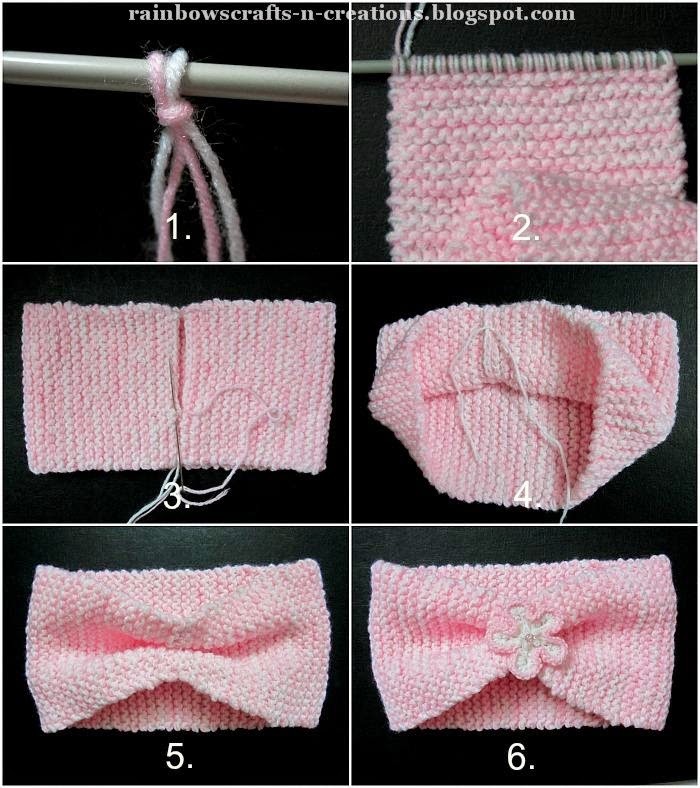 This pattern calls for two skeins of yarn (pink & white), use a strand of each skein at the same time and you have to treat these two strands as if they were a single strand while knitting. 2. needle : a pair of single-pointed needle size 4.5mm and yarn needle. 3. one knitted flower [click here to find out the pattern of knitted flower]. 1. Cast on 20 stitches with the double-yarn. Just cast on as if you cast on with single piece of yarn, the difference is you need to hold two strands of yarn together. 2. Knit the double-yarn stitches every row until you reach your desired length. I have knitted a 17 inches long knitting piece for this project. Knit bind-off after you finished knitting the last row. Then, cut the yarns, leaving the both yarn tails about 2 inches long and weave them in the piece. 3. Bind the two short edges with mattress stitch. You can either use the cast on tails that you left to get start or use a piece of new yarn. 4. Fold the part as shown in the photo. Place the right side of the joining edges facing together. Tie a firm knot at the position where 1/3 of the folded part (right on the joining edges) from the top. 5. & 6. 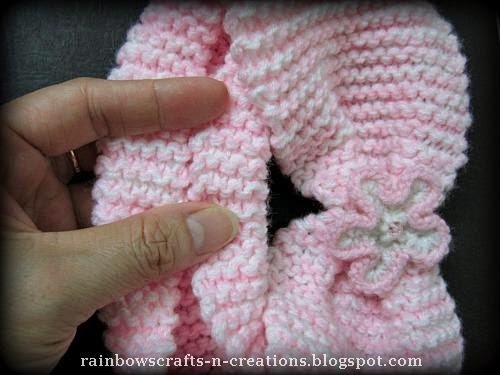 Press to shape pleats and then sew a knitted flower on it. A simple headband is done! If you find that the width of the headband is too wide. Just fold any part of your piece where you like in half with the two sides meeting at the centre. You can either sew both sides together now or fold any part when necessary. 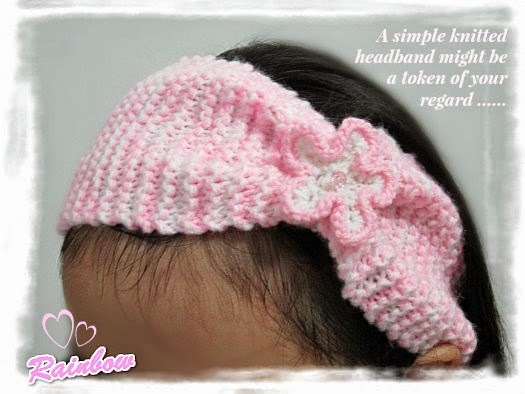 The photo at the right side shows the way how I fold the headband piece at the lower part of my daughter's head.